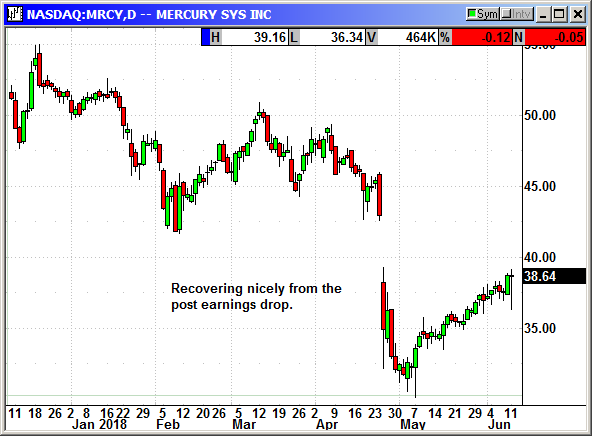 The markets closed positive on Monday although well off their highs. There was tremendous uncertainty about the Korean summit and whether it would even impact the market regardless of the outcome. As of 1:AM ET it appears to be going well. Nobody actually expects anything to be accomplished other than setting some ground rules for future meetings by administrative staff on both sides. On the positive side, President Trump did not walk out on the Chairman and Kim Jong Un did not storm off back to the hermit kingdom after being confronted about denuclearization. This is an unbelievable political event that could start Korea on the road to prosperity. Traders bought the market on Monday but the closer we came to the summit the weaker they became. The Dow closed 87 points off its highs with only a 5-point gain. The S&P gained only 3 points. After the Trump post summit press conference on Tuesday morning ET, the uncertainty will fade and investors will begin to focus on the Fed rate hike on Wednesday. Typically the markets are positive on the day before a Fed announcement and that suggests we could see a relief rally on Tuesday fed partially by Fed rate hopes. However, a lot of analysts believe the Fed statement will be significantly more hawkish given the surge in economic activity. That could bring the market back down on Wednesday. 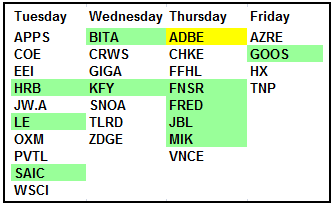 The ECB and BOJ also have meetings this week and they will also be closely watched and could be market movers. The price indexes could influence Fed decisions, if not at this meeting, they could eeasily impact the outlook for the next meeting. 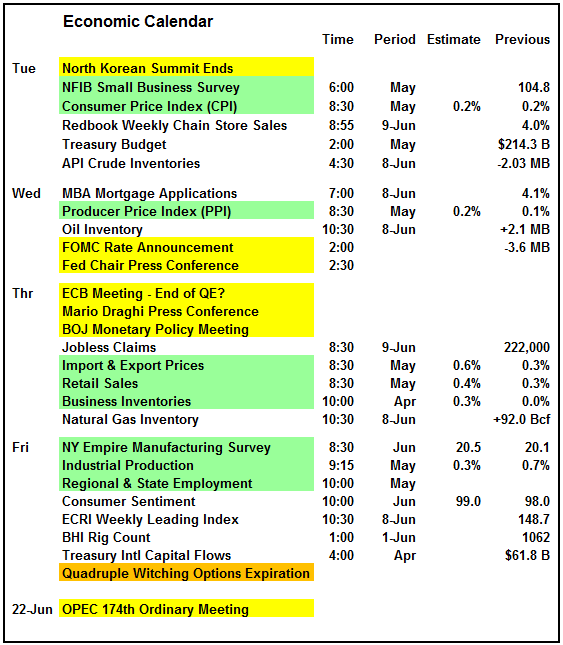 The earnings calendar is uninspiring so the economics better be good. 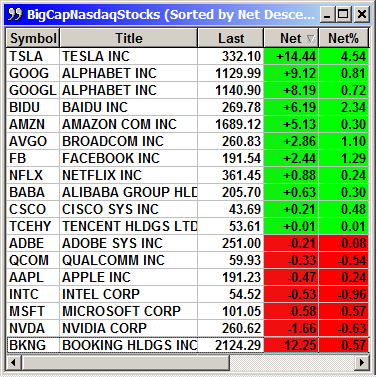 Adobe will be the most watched with earnings on Thursday. 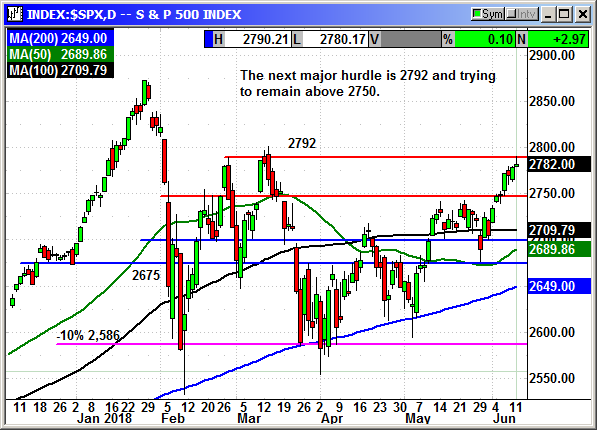 The S&P hit major resistance at 2,790 on Monday and came to an immediate stop. The index retreated to give up 8 points and close with a 3-point gain. Despite the retracement this was still a decent day. We could have easily seen the index close sharply negative but the selling was minimal. Volume was light at 6.1 billion shares and advancers were still 4:3 over decliners. The index needs to close well over that 2,790 level to trigger additional short covering. The Dow was almost identical to the S&P. 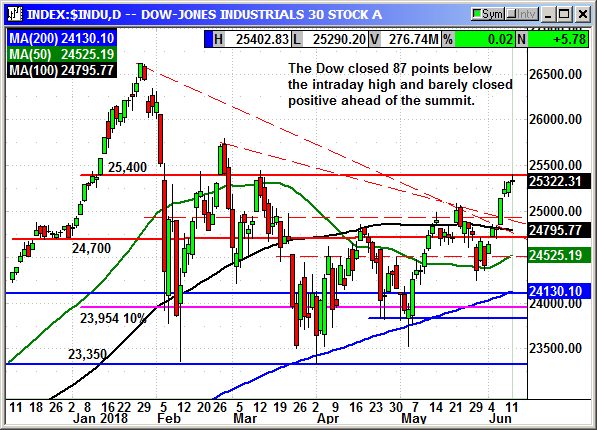 The Dow tested resistance at 25,400 and immediately began to decline. This is critical resistance. The A/D ratio on the Dow was almost dead even with only one less decliner than advancer. Once the summit is over, the headlines will pick up again on the tariffs. This is Dow negative and after the disruptive G7 meeting, the headlines could be worse. 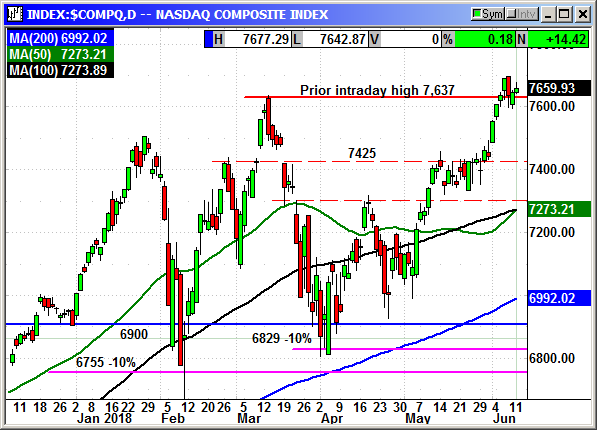 The Nasdaq closed 18 points below the intraday high but still managed to gain 14 points for the day. The index is only 30 points from its record high close. The selling was minor and some investors bought the dip. Only one big cap tech stock lost double digits and that was Bookings Holdings, formerly Priceline.com and it only lost half a percent. As long as the big cap techs remain positive the market should move higher. 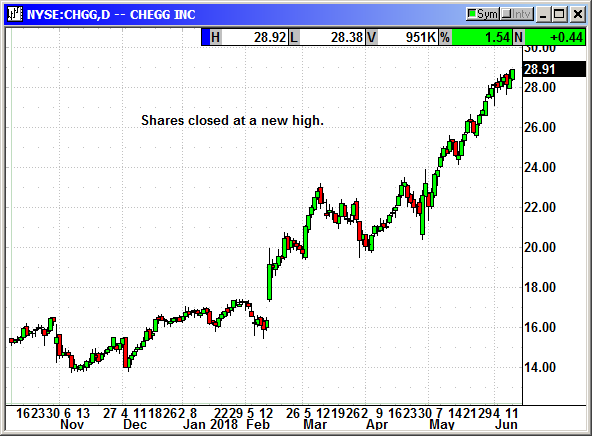 They do not need to be making large gains, just producing positive closes. I think the Russell 2000 gave me the most hope for a positive week. 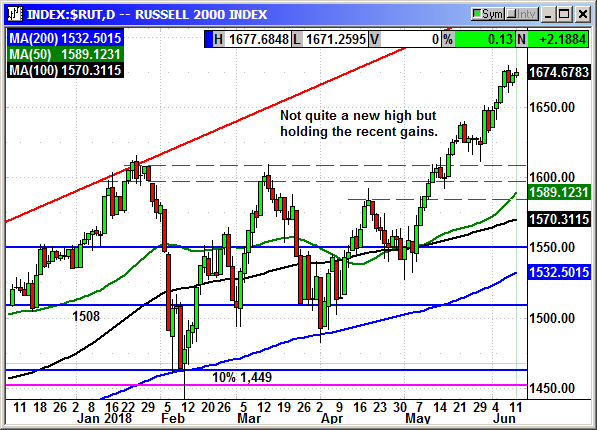 With all the uncertainty around the summit, the Russell actually gained 2 points and closed only 2 points below a new high. 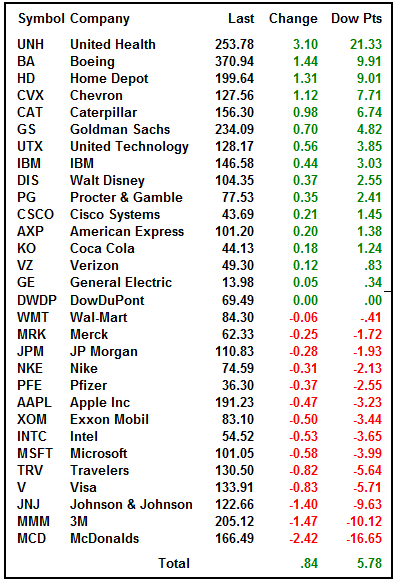 That is great relative strength. I am not going to try and predict the market for this week. There are too many cross currents and there will be literally hundreds of headlines impacting the market over the next three days. I do believe we should remain cautiously long until proven wrong. Any dip could be a buying opportunity. IBM is on the way back. The last several lyears have been hard to watch but they have turned the company around with their strategic imperative restructuring program. About half of IBMs revenue now comes from those strategic imperative applications that did not exist 10 years ago. IBM just announced the most powerful supercomputer in the world named Summit. This computer can do 200,000 trillion calculations per second. Companies are going to be beating a path to their door for run time on this beast but even better they will be ordering smaller versions for themselves. The company just announced a major expansion to their cloud with 18 new availability zones around the world. They already have 60 zones and this will add to them. A zone is a geographically located set of data centers and customers near a particular zone will benefit from lower latency times and faster processing. IBM's clour business already generates $17.7 billion in revenue and growing rapidly. IBM is already the leader in enterprise cloud services. IBM is also a blockchain company. They have multiple blockchain development projects underway for things like mobile payments, faster crypto currency transactions, real estate records, etc. 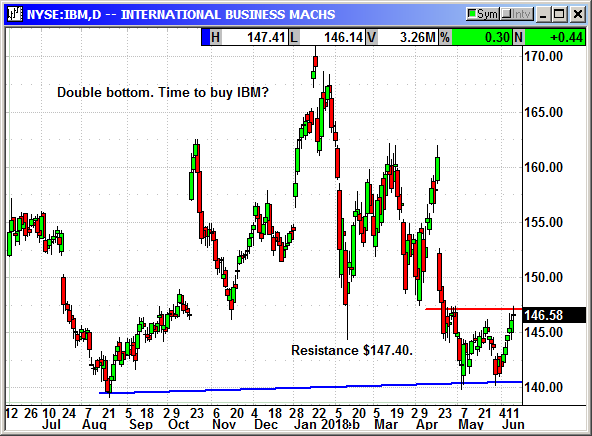 IBM trades at a PE of 12 with a 4.5% dividend yield. 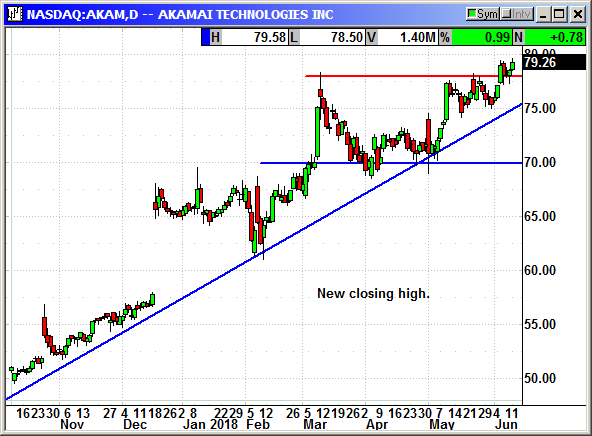 Shares closed at a five-week high on Monday and almost a breakout over short term resistance. Buy August $150 call, currently $3.05, stop loss $140.65. No specific news. Shares closed at a new high. No specific news. 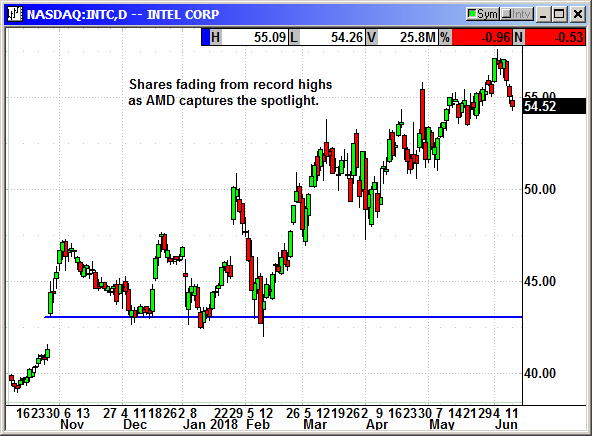 Intel shares have been fading as AMD has been getting all the positive press. Our June option is expiring, close the position. No specific news. Shares still rebounding from the post earnings drop. 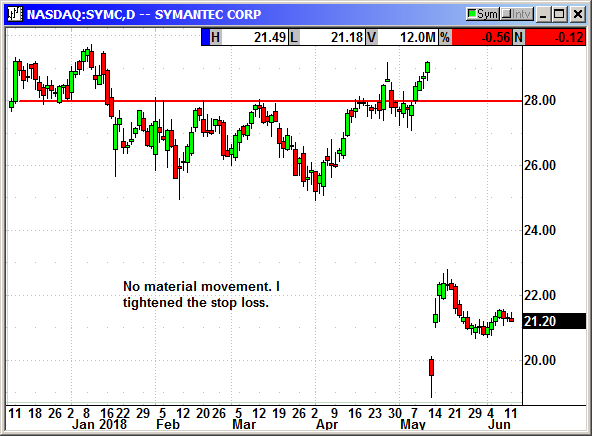 We reloaded the Micron position at the open last Tuesday after we were stopped out for a gain the prior week. 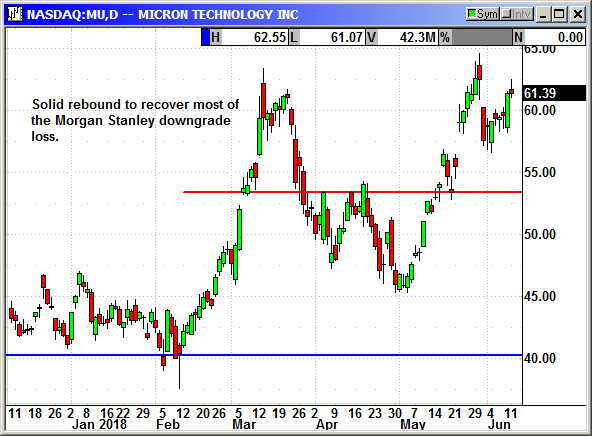 Micron is still moving higher and projecting explosive growth over the next three years. 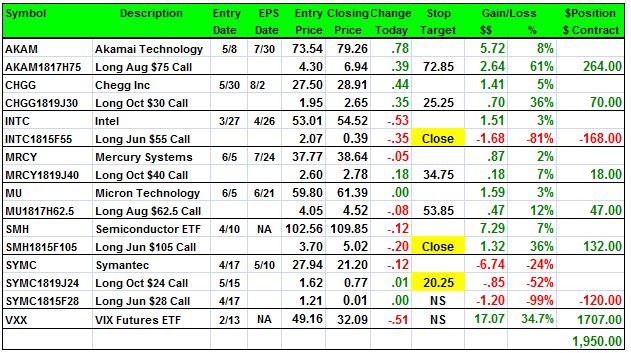 Long Aug $62.50 call @ $4.05, see portfolio graphic for stop loss. 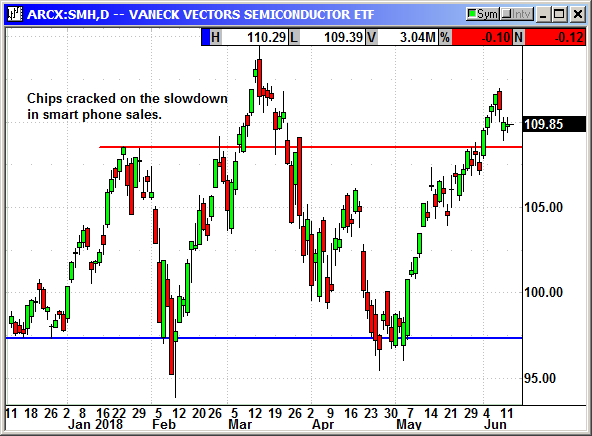 We were doing ok until the warning on a 20% reduction in component orders for Apple and Broadcom warned of slowing smartphone sales. This is an expiring June option. Close the position. No specific news. No material movement. The secondary rebound has faded. I tightened the stop loss. The older June option will expire this Friday. 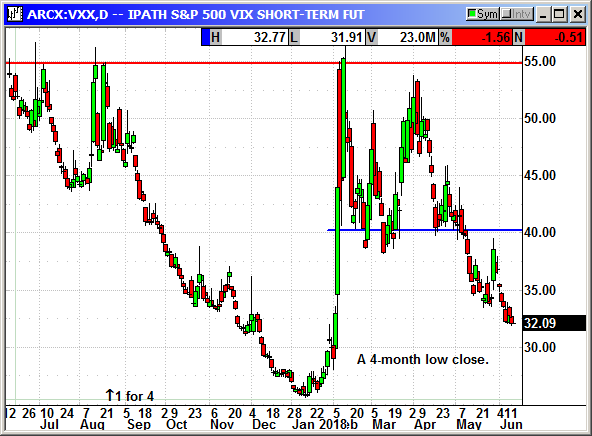 Volatility has fallen back to $32 and a 4-month low.